Recycle juice pouches into a refreshing bag. 21 Capri Sun Drink Pouches. Capri Sun pouches come in cases of 12, so you will need to purchase 2 cases. The obvious answer here is to drink it. Collect pouches over time, or drain them into a jug. I do not recommend drinking 21 Capri Suns at once. Friends may start avoiding you due to your maddening hyperactivity. Once the bulk of the juice is out, you will need to get rid of the extra juice left in the pouches. Lay out a towel on the counter and place your Capri Sun pouch face-up. Starting from the bottom, use a rolling pin to squeeze every drop of sugary goodness outta there. We will use 6 Capri Sun pouches to make the bottom and sides of the bag. Overlap the top of one Capri Sun pouch 1/4" over the bottom of another. Stitch together with a straight stitch. For extra strength and decoration, straight stitch, then zigzag stitch on top. Repeat until you’ve got a strip of Capri Sun pouches, as shown. Overlap the right side of a Capri Sun pouch over the left side of another. Overlap at least 1/4". Straight stitch, then zigzag stitch. Make four sets of three stitched pouches. Stitch the bottom of one 3 pouch row to the top of another row. Again, overlap at least 1/4" of the material. Make two 6 pouch panels like the one shown here. Lay the body panels face down, along with the strip of pouches we made in step 2. Overlap the bottom edge of a body panel over the two Capri Sun pouches that are smack dab in the middle of the strip. Overlap at least 1/2" and straight stitch, then zigzag stitch. Repeat with the other body panel, sewing it to the other side of the same two Capri Sun pouches on the strip. Fold up the long strip of Capri Sun pouches. Stitch each edge of the strip to the body panels. Repeat with the other side of the bag. You can experiment with overlapping the side panel over the body and vice versa. How you overlap and stitch will determine what the seams of your bag look like. You can also stitch the backs of the pouches together to form a seam that puckers out. Your handles could be created out of ribbon or stitched fabric, but I prefer making even the handles out of Capri Sun pouches. Cut a Capri Sun pouch into four equal strips. Stitch them top to bottom. You should need 6 strips for each handle. How thick you want your strips is up to you, if you want to just cut the pouches in half for super thick straps, that sounds fine to me! Zigzag stitch all along the side of each handle. This will add extra strength to the handles and make it match the rest of the bag. This will add extra strength to the handles and make it match the rest of the bag. Where you stitch the handles is up to you. They could be attached on the inside our outside of the bag, right at the top or a few inches down. The most important part of sewing on the handles is sewing them on securely. Straight stitch a rectangle at the end of the strap. Then, sew an ‘X’ in the middle of the rectangle. Backstitch or zigzag to secure. At this point, you can cut a piece of cardboard to fit in the bottom of the bag, or use as-is. This makes a fantastic reusable grocery bag. Take it to the store and buy some more drink pouches... just to see what the cashier says. 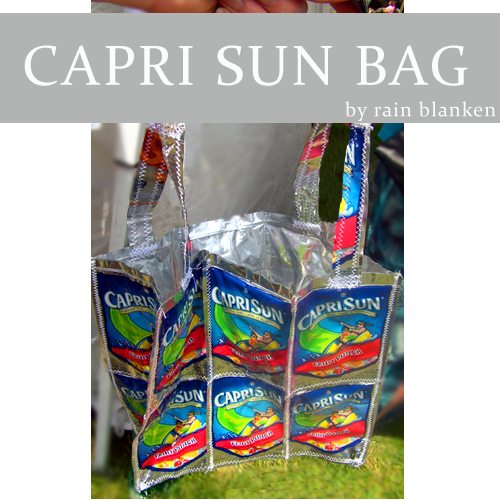 The Finished Bag: See the finished Capri Sun Bag. When you are done with this project, we would love to see it. Upload a photo. 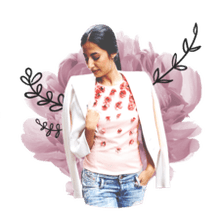 You could be featured on the DIY Fashion blog, in our newsletter and all the social media in between. I love to get the word out about great handmade work. Please Note: Photographs, patterns and illustrations contained in this article are copyrighted ©Rain Blanken and Getty Images, and licensed to About.com, Inc. Do not redistribute these photographs or illustrations in any form.